Like his father before him, Daniel Blackland is an Osteomancer (someone who attains magic by ingesting bones) At the age of 6, Daniel's father fed him his first set of bones hoping to make his son strong. It is a strength Daniel will need in days to come if he is stay alive. Daniel remembers all to well the sound of the Hierarch eating his father. Until now, Daniel has focused on staying alive but now that he and his crew are tasked by his crime boss Uncle to break into the area where the Hierarch keeps his collection of magical bones, and a sword fashioned from Daniel himself, it's going to take every ounce of magic to Daniel has to survive. In many ways California Bones could be described as a dark fantasy. Some scenes are gritty and horrifying like when Daniel's father becomes a meal for the Hierarch. What Daniel remembers most is the sound of the Hierarch chewing. That one detail gets repeated several times in the novel and it never gets less creepy. Van Eekhout does a great job setting up the Blackland universe and the rules of magic are clear and easy to understand. I love the idea of magic evolving from the bones of animals - sometimes even mystical animals because it invokes powerful imagery. Every time Daniel invokes his Kraken magic, I found myself picturing the mystical beast and what powers it might have. That said, one of the major problems with this book is that part of it really feels dialed in. For instance, Daniel gets tricked into pulling a job for his criminal boss uncle. How many times have we seen the "good guy" forced to work for a bad one to get the end result he needs or to save someone close to him? From the beginning, there's never a doubt that the uncle will betray Daniel and lead to an escalation of the problem. It means there's no twist to figure out; it's all so very obvious. I also found that Van Eekhout really needs to show and not tell in his work. In California Bones, we are told repeatedly how tight Daniel's team is and how they would do anything for their fearless leader. Each of them can benefit if the job goes well but apparently, the reason they all say yes is because Daniel asked them. A tight knit group breaking into a government vault makes sense and I don't need to be hit over the head with how close they are. In fact, what Van Eekhout should have done is given us examples of them displaying their closeness to each other, caring for each other. Van Eekhout barely pulled back from this by creating woo woo reasons for the teams loyalty to Daniel but it didn't make up for the constant reminders about how close the team is without an evidence to back it up. Which leads me to yet another significant problem - characterisation. I don't feel as though I got to know any of the characters in the book and thus, I couldn't really invest in them. They all seemed empty and were largely defined by what magical powers or skill set they have attained. The only one to step outside of that narrow parameter is Moth, who plays the role of the enforcer. Unfortunately, the only characterisation Moth get is his size. In practically every scene that Moth is in, Van Eekhout includes some reference to how large he is. Though his role is really small the next character which really stood out to me is Wilson Bryant. If the piano downstairs was an island, then the bed in the center of the vast bedroom was a continent. It rose on a mound of beach sand. The headboard was a cabinet towering to the ceiling, the shelves cluttered with more trophies and memorabilia, including photos of Bryant with Hollywood luminaries and members of the Council of Six, and more guitars, and even a surfboard. And propped up on pillows sat Wilson Bryant himself, bearded, huge, and barely contained by a white silk kimono. Yellow legal pads and In-N-Out burger wrappers lay scattered on his lap. Beside him was an acoustic guitar, half covered by a sheet like a sleeping lover. Odd reaction to three strangers in ski masks bursting into his room. Note the description of Bryant along with his name. To me, Van Eekhout is clearly writing about The Beach Boy's Brian Wilson. The circumstances are the same as Wilson suffered during his recluse period, including the food abuse. The only way to read about Van Eekhout's Bryant and not think of Brian Wilson, is if you've never heard of the Wilson and his struggles. I really want to give Van Eekhout a break on this one because mocking what Wilson has gone through to create a throw away character in a book is horrendous at best, particularly because Wilson has been struggling with mental illness for much of his life and has hallucinations. Though California Bones is obviously set in California, there aren't a ton of POC. Daniel, the protagonist, along with his mother are Latino. There are no cultural markers attached to either one and the sole identifier is the brown skin. I appreciate having a character of colour for a protagonist but at the same time, don't understand why some writers (in this case I am including Van Eekhout) refuse to do the work to write a character who is well rounded and at least marginally steeped in their culture. Daniel might as well have been a White character painted brown for all of the cultural and ethnic markers Van Eekhout decided to include. 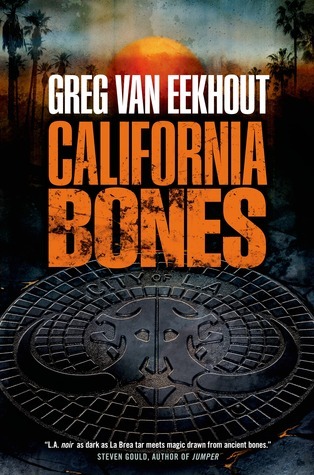 California Bones is filled with more action than characterization. While Van Eekhout does create a great magical world, what he has his characters do is really one note. It's a plot line I've seen in several movies and several books. There's no doubt how this book is going to end from the moment Daniel decides to go after the Hierarch's store of magical bones. For all of the action, I should have been on the edge of my seat but because California Bones is so very predictable, I never even reached close to that point. California Bones is definitely a case of your mileage may vary. If world setting and good descriptions are your thing this might be the book for you. If however, you like solid characters and a plot which isn't predictable, you'll want to skip this one.